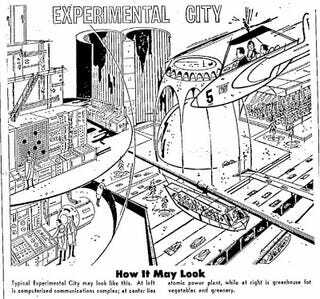 The January 22, 1967 Lowell Sun (Lowell, MA) ran this illustration of an experimental city of the future. Typical Experimental City may look like this. At left is computerized communications complex; at center lies atomic power plant, while at right is greenhouse for vegetables and greenery.